The tomb of Sha'h Husayn [Husain Shah]. bl.uk > Online Gallery Home	> Online exhibitions	> Asia, Pacific and Africa Collections	> The tomb of Sha'h Husayn [Husain Shah]. In 1787 a visitor to Gaur, Reuben Burrow described the ruins in a journal deposited in the library of the East India Company, 'these tombs were, not long ago, in perfect order, and were held in a manner sacred, till they were torn to pieces for the sake of the stone.' Infact, much of the stone taken from these tombs was used by the British army for public works in Fort William. 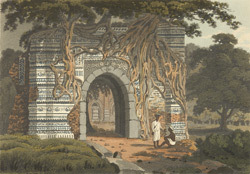 This aquatint shows the gateway and tomb beyond of Husain Shah, sultan of Bengal in the early-sixteenth century, who ruled from his capital at Gaur. The brick gateway has a central arched entrance with engaged polygonal bastions to either side. Its surfaces are covered blue and white decorative tilework. Neither building survives today.